Winter league 2013, legs 2 and 3. Somehow, I didn't get round to writing up leg 2, and no-one beat me to it. Press have the results for all three legs up. How did we do, overall? (And at this point, "we" = the crews I was in. Someone else can write up the other crews :-). As an IM3 crew, poorly; as a novice crew, excellently. So, that's our problems solved then: we drop Dr Southgate. Or we drag our other points back in (paging Dr Howard...). We were nearly a minute (overall) faster than the best Nov 8 (and still 30 secs faster on the first leg, when we didn't have Dr S). 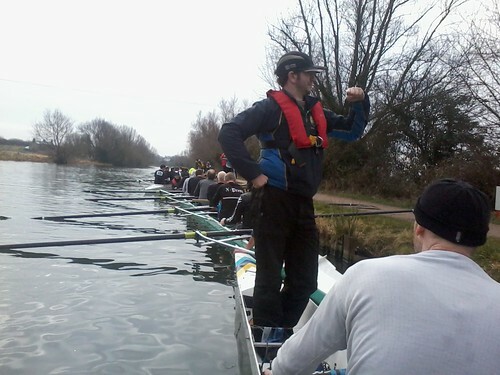 Oh, and did I mention that the third leg was an exceptionally wet row? Outstandingly so, despite being clearly our fastest. But we were about a minute (overall) slower than the next 3 IM3's, and 2 minutes behind Champs M1/M2 squad composite - but then again, we know both their M1 and M2 are "about as fast" as our M1, and we're not yet close to our M1. And me, as a single sculler: I got faster by ~30 secs each leg, but it was mostly a reminder to me that I need to get some more practice in and up my technique. * Squamata WL3 courtesy of Simon E. * Squamata WL2 ditto.